Millions of words have been written about Bob Dylan since his first appearance in New York City in 1961. Some of those words were damning as befits any person of unique and singular talent. After all, by breaking new ground and setting new standards, they alienate those who wish for the status quo. Many more words written about Dylan have been in praise of the man, his talent, vision, and influence on the world in which we all live. Now David Dalton has added a new volume to the pantheon of books on the subject of Bob Dylan, the man, his influence, and his art. The book, entitled “Who Is That Man? :In Search of the Real Bob Dylan,” published by Hyperion, will be released on April 24, 2012. As a long-time Dylan fan, I had the honor of being given an advance copy to review. This unsophisticated boy raised on the iron ore range of northern Minnesota came to be known as “the quintessential New York hipster.” That gangly, sallow, almost sickly waif, chain smoking cigarettes, and nervously tapping his foot to some unheard rhythm playing in his head, soon became the poet laureate of his generation. Not just that, but also one of the most influential people of the twentieth century, through his words, his music, his style, and the mystery of exactly who and what he was, and who he would become. He will arguably be remembered in the hushed and revered halls of poetry, music, and cultural icons along side of Milton, Donne, Emerson, Whitman, and probably even Shakespeare. As much as any of them he changed the language, the perceptions, and the actual world around him simply by moving through it with a different vision than had been seen before. Bobby Zimmerman came out of the bleak Minnesota iron range country of Hibbing, a monochromatic town in a black and white world. Easy-listening music and crooners populated much of the radio dial, harking back to an earlier age in taste and style. Gritty Delta blues could be heard through the static on a good night. Rock and roll was still thought of as a flash in the pan, and country was music for small town rubes and backwoods dwellers. Then in the late fifties folk music made a big revival with acts like The Kingston Trio, Odetta, and Pete Seeger, and TV shows like “Hootenanny.” And suddenly that kid from Hibbing, calling himself Bob Dylan began learning traditional folk songs, writing songs of his own, and singing them all like no one had ever done before. “Blowin’ in the Wind,” “The Times They Are a’Changin’”, “Mr. Tambourine Man,” and more. Much of Dylan’s early work gave rise to the sub genre of folk that came to be known as “protest music,” and Dylan was the crown prince of protest, even as he rejected the title. But soon, Dylan turned up the color dial and the monochrome slid away. He began to write songs filled with imagery, tunes, dream sequences, and word play, and vocal inflection that changed the world, not just of music, but the world itself. It is into that world that David Dalton takes the reader. From the middle-class Bobby Zimmerman to the twenty year old folk-singing hobo named Bob Dylan, to the enigmatic pied piper who mystified and enthralled those who would hear his words and see his vision. Dalton takes us from those traditional sounding folk songs that rolled off Dylan’s tongue with such ease and poignancy, to the marriage of surreal imagery and wrenching emotion with lyrics that can truly be called poetry. Dalton has the good sense to dwell at some length on the drama inherent in that narrative arc and serves up a panoramic tale, interspersed with tidbits and analysis of the music and its impact, almost as much as he does about the man. This book builds the bridge between the waif-like Woody Guthrie clone who blew into NYC with a rag-tag wardrobe and an acoustic guitar, and the amphetamine-fueled mercurial Rimbaud rock and roll poet who invented a new way of writing, singing, and thinking. Whether Dylan is that magician or the tightrope walker in the back alley of “Desolation Row,” he is constantly shape shifting, calling up another spell with which to mesmerize the audience into thinking he’s not there. He performs sleight-of-hand tricks right before our eyes, and while we understand that we’ve been fooled, we can’t help but to wait breathlessly for the next illusion. And then we realize as the crowd shuffles out, that maybe Dylan’s been an illusion to everyone all along, that magician who gives us no time to think. 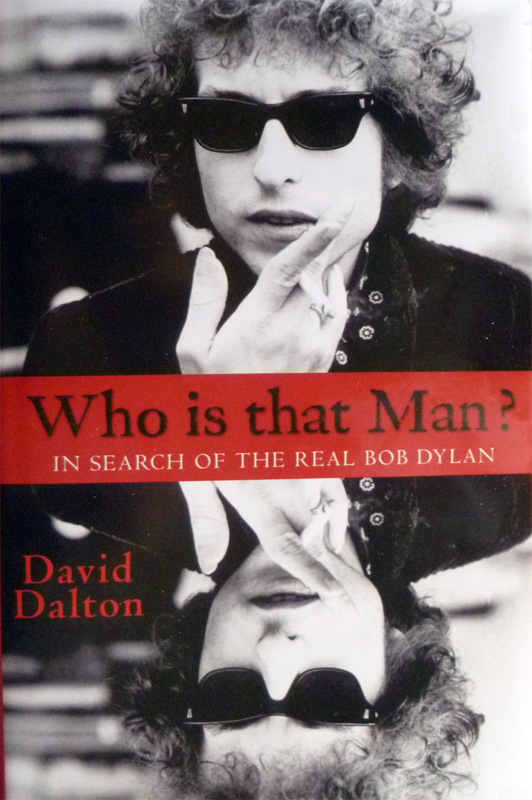 In his attempt to shed light into some of the dark corners of who and what Dylan really is, Dalton offers less a straight biography than an inspired, imaginative investigation into Dylan’s many sides. The author sifts the songs for real-life clues and tackles certain aspects of the Dylan story that have long been a source of controversy. Although the book ends in a bit of a limbo, this compelling attempt to read a half-century’s worth of shape-shifting and re-invention from an actual living legend strikes a good balance between admiration and skepticism.